The Certificate Option is designed for students who require at least one year of pre-requisite coursework to become eligible to apply to professional schools. Students applying to the Certificate Option must designate whether they are interested in the Enhancement or Career Changer Pathway; interested students should click on the links provided for a full explanation of these pathways. The PB-PMHPP is not designed to assist students who have already applied to or are in process of applying to medical, dental, or other health professional school simultaneously with making application to the PB-PMHPP; this is NOT a "glide or growth year" program. Therefore, applicants to the PB-PMHPP are discouraged from taking entrance exams (eg. MCAT, DAT) until they have completed the Duquesne program. Students enrolled in the Certificate Program must complete a minimum of 24 course credits in the sciences and humanities to be awarded a PB-PMHPP certificate. 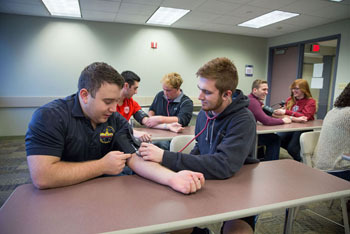 While all curricular plans for the Certificate Program are individualized and designed uniquely to meet students' needs, we strongly recommend that all students include at least one non-science course each semester in order to help prepare them for the non-math/science professional expectations required of all medical and health care professionals, including admission examination (eg, MCAT, DAT) critical thinking and reasoning sections, professional school interviews, and future clinical practice expectations. Typically, Certificate Program students take three sciences and one non-science course in each semester. Post-Baccalaureate students take classes with both undergraduate and graduate students at the University. PB-PMHPP Certificate students are required to enroll in a minimum of two (0 credit) PB-PMHPP courses over the time of their enrollment. These courses are designed to provide PB-PMHPP students with basic training in medical skills and health safety requirements including, but not limited to HIPAA training, blood-borne pathogen training, handwashing, gloving, sterile field, and entry-level physical examination skills and assessments. Students also are introduced to inter-professional education and evidence-based practice, and the anatomy, pathophysiology, and terminology of the cardiorespiratory, neurological, and gastrointestinal systems. To provide students with more options upon matriculation from Duquesne and make them more attractive candidates to medical, dental, or other health professional programs, Some PB-PMHPP students also choose to couple their Certificate work with the pursuit of masters degree. This Certificate-Masters Option generally requires two full years of study. The PB-PMHPP currently has three options for masters degrees under this program: Master of Arts in Health Care Ethics, Master of Science in Biotechnology or Master of Science in Biomedical Engineering. Students interested in one of the master's degree options should apply to the PB-PMHPP first through the online application, and then await further instructions regarding the master's application, once accepted to the PB-PMHPP. Should a student choose to pursue a master's degree program not listed above, it would be the student's responsibility to meet all requirements of that alternative masters degree program, and to pursue the application requirements independently. For more information, please click here. Applicants who need less than 24 credits to meet their admission requirements for medical, dental, or other health professional program or admission examination pre-requisites, and prefer a more independent approach may be interested in pursuing the PB-PMHPP Non-Certificate Program. As with the Certificate Program, students will work with a PB-PMHPP advisor to create individualized curricula. Students in this Non-Certificate Program are not eligible to enroll in the PB-PMHPP courses and are not eligible for PB-PMHPP Certificates, Duquesne University endorsement/committee Letters, or assistance with the preparation of their applications. They will be eligible for assistance with the submission of their professional school letters. Students in this program are required to complete all coursework in no more than 24 months or two years (whichever occurs first).